4 But you, brothers and sisters, are not in darkness so that this day should surprise you like a thief.5 You are all children of the light and children of the day. We do not belong to the night or to the darkness. 6 So then, let us not be like others, who are asleep, but let us be awake and sober. 7 For those who sleep, sleep at night, and those who get drunk, get drunk at night. 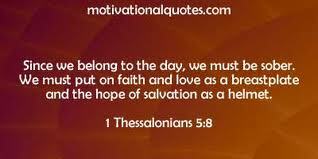 8 But since we belong to the day, let us be sober, putting on faith and love as a breastplate, and the hope of salvation as a helmet. 9 For God did not appoint us to suffer wrath but to receive salvation through our Lord Jesus Christ. 10 He died for us so that, whether we are awake or asleep, we may live together with him.11 Therefore encourage one another and build each other up, just as in fact you are doing. This entry was posted in Discipleship and tagged brothers and sisters, Christianity, coming of the lord, God, Holy Spirit, hope of salvation, living to please god, Lord Jesus, lord jesus christ, Paul, quiet life, religion, theology, Thessalonians, thief in the night. Bookmark the permalink.